Eager to win glory as a soldier in a noble cause, Lafayette left his native France and arrived in Philadelphia in July 1777 to fight for American liberty. He was commissioned a major general in the Continental Army and established a close bond with General George Washington. He performed heroically at the Battle of Brandywine (September 11, 1777), returned to France and persuaded Louis XVI to send 6,000 men to fight immediately, then came back to America in April 1780 to take command of an army in Virginia. 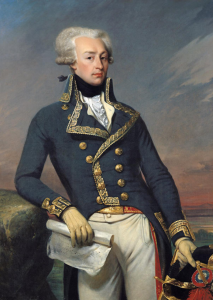 Lafayette was instrumental in bottling up Charles Cornwallis and his army on the Yorktown peninsula in late July 1780, which set Cornwallis up for the defeat that effectively ended the American Revolution.